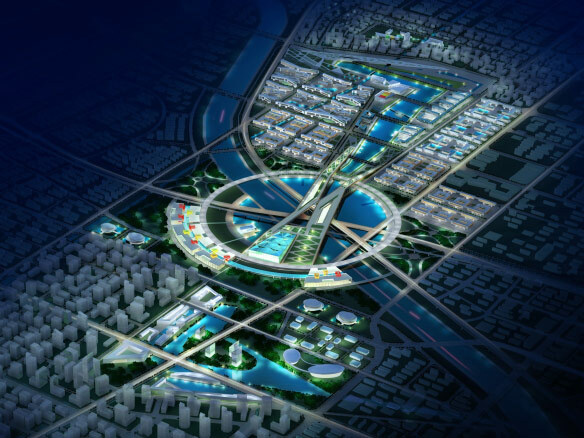 In Fall 2012 Cordogan Clark & Associates was one of five firms, and the sole US firm, invited to compete in the competition for the new Masterplan for Zhengzhou, China. Using traditional Chinese graphic metaphors as inspiration, our urban design is designed for functional efficiency and sustainability. Lengthening urban blocks along the east / west axis allows longer north / south building elevations, improving natural daylight and mechanical efficiency. Greenscape is woven throughout the site design, for optimal building spacing, natural ventilation, and views, while creating a “city in a park.” Extensive parkways and waterways enhance and encourage pedestrian, bicycle, and water-taxi activity. Improved transportation, green buildings, sustainable building technologies, water conservation and reuse, natural irrigation, and smart grid infrastructure are just a few of the features incorporated to help to achieve sustainable environmental development in this design. This design for this new 15 square kilometer urban core takes into account adjacent urban areas that have already been developed. It integrates them into a strong, cohesive whole. It creates a powerful visual urban identity that will be immediately recognizable. In addition to being a celebration of urban life, this plan celebrates the Yellow River that bisects the site.